As we have seen over the last couple of months, Paul knows he’s supposed to be in Rome. 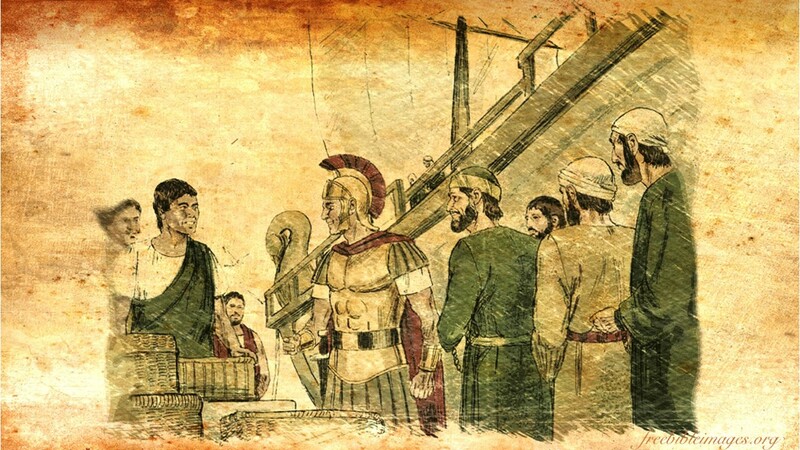 He wants to preach the gospel on Caesar’s doorsteps. But it has not been smooth sailing. We saw that last week as Paul along with the crew and passengers on the ship he was sailing are washed up along the shores of Malta. For a while, it didn’t look like they were going to make it. After being pulled ashore, cold and wet, things started looking up. We now expect Paul to have no further complications in his travels; after all, he’s suffered enough. Of course, that’s not what happens. At times, things we really want to do or feel we are called to do, are difficult. But just because we have setbacks doesn’t mean we should give up. Today Paul finally makes it to Rome. But there’s still one more challenge in his path. 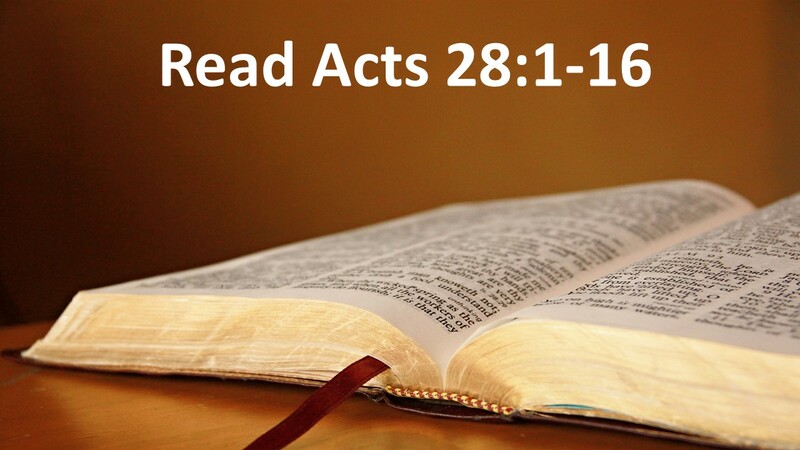 For those of you keeping count, I have just one more sermon on the book of Acts! Our text today is from the 28th chapter, the first 16 verses. Daniel is mistaken as a god because he survived an arrow to his chest. Of course, the arrow stuck in his gear and didn’t penetrate his heart. 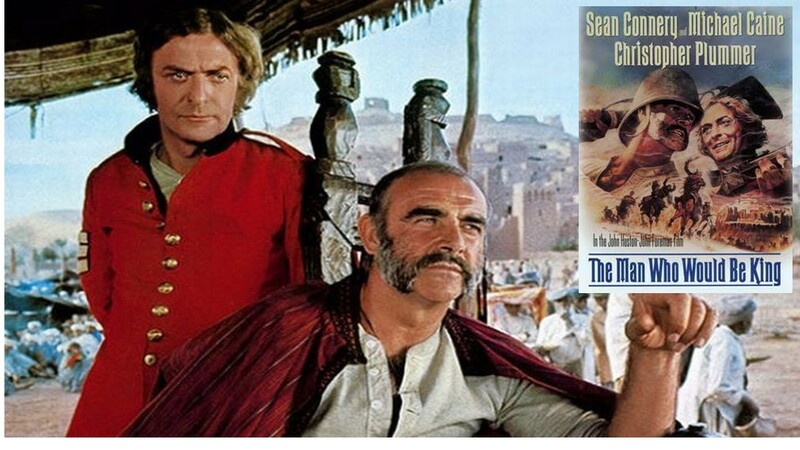 The people in this remote land, the story is set in 19th Century Afghanistan, flock to him as a god that was sent by Alexander the Great (whom they also saw as a god). Unlike Paul, who was probably horrified by people thinking he’s a god, Connery’s character uses this confusion to his benefit. And, of course, when discovered that he’s not a god, that he bleeds red like the rest of us, things don’t work out well for him. But it does make a great plot for a story, doesn’t it? Let’s dig into our text. Once Paul and his shipmates wash ashore and finally begin to dry out, it begins to rain. It’s cold. They can’t get a break. But the residents of the island display a wonderful talent for hospitality. 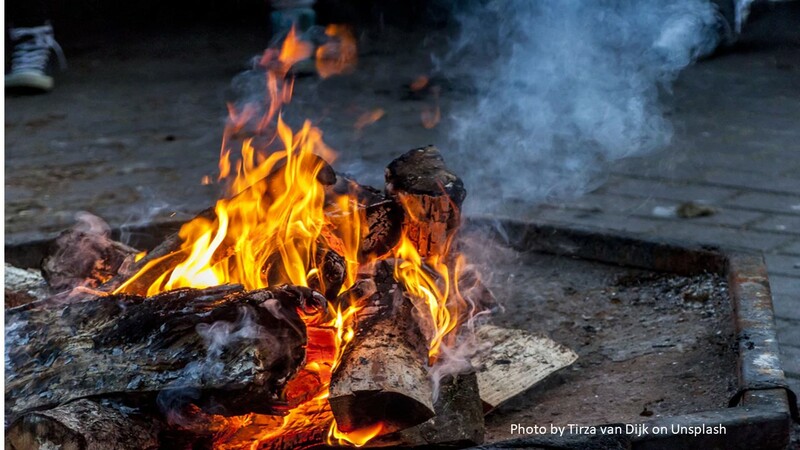 They build a fire and encourage everyone to gather around and warm themselves. I remember hiking the Appalachian Trail on a wet and rainy day. It had started to rain the night before. We’d packed up in the rain; we hiked in the rain. Our goal was a shelter about a fifteen miles away. The last few miles involved a long climb up a very muddy Bly Gap. Muskrat Creek Shelter was just after we got to the top. It was a three-sided lean-to with a fire pit in front. Another hiker was there before us. He’d skipped hiking in the rain that day, deciding to stay in the shelter where he started reading Dostoevsky’s Crime and Punishment, a book someone had left behind. And he had a blazing fire. He invited us to join him around the fire as he whipped up some Martha White Cornbread mix and fried for us some hoecakes over the fire. We nicknamed him “Cornbread.” Like the residents of Malta, he was an example of hospitality. If you’re ever caught in a storm, I hope you come across such angels! They’ll make your day better. Better yet, and this is your second application of the text for the day, if you find someone in a storm, why don’t you become their angel and show them hospitality. Such behavior will help make the world a better place. After we warmed up that afternoon at Muskrat Creek Shelter, several of us went out to gather more wood to add to Cornbread’s fire. It was the neighborly thing to do. Likewise, Paul also pitches in to help, going out to collect some wood. Only he manages not just to come back with twigs and sticks. He picks up a snake which may have been somewhat lethargic due to the cold. Snakes are cold blooded, you know. When chilled, they can’t move and have to depend on the sun (or in this case a fire) to warm up their bodies so that they can move. This may explain why the snake was confused with a stick. But when Paul brings the wood over by the fire, the snake warms up and isn’t too happy at its relocation. This snake, we’re told it’s a viper, latches on to Paul’s hand. Paul dislodges it by shaking it off into the fire. Those observing this immediately think Paul must be a really bad dude. After all, why would he survive a shipwreck only to be bitten by a viper? You know the comic idea of the Greek gods up on Olympus, sending out lightning bolts to zap someone they’re displeased with. Think of them aiming at Paul, lightning bolt after lightning bolt, till they finally zap him. That’s what’s going through their minds. But when Paul doesn’t show any ill effects from the bite, the people change their thoughts. Now they think Paul must be a god. Why else would he have survived? 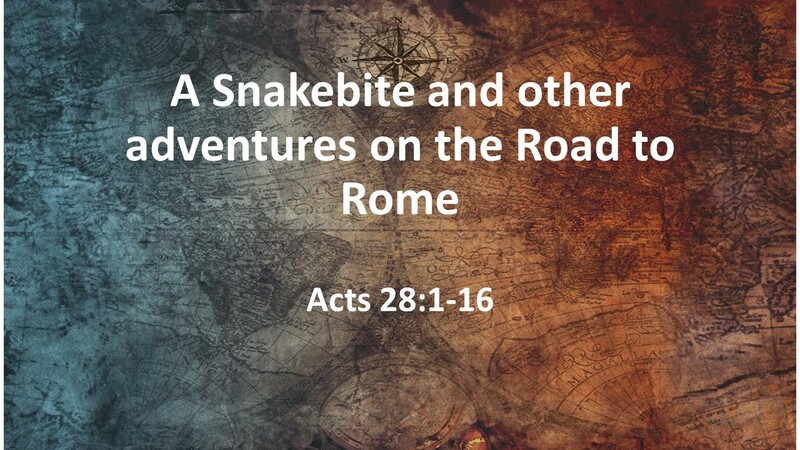 Why was Paul saved from the snake bite? Certainly, Paul has a larger mission before him, of going to Rome, but more immediately, he’s also able to bring healing to those on the island. He heals the father of one of the leading citizens of Malta. 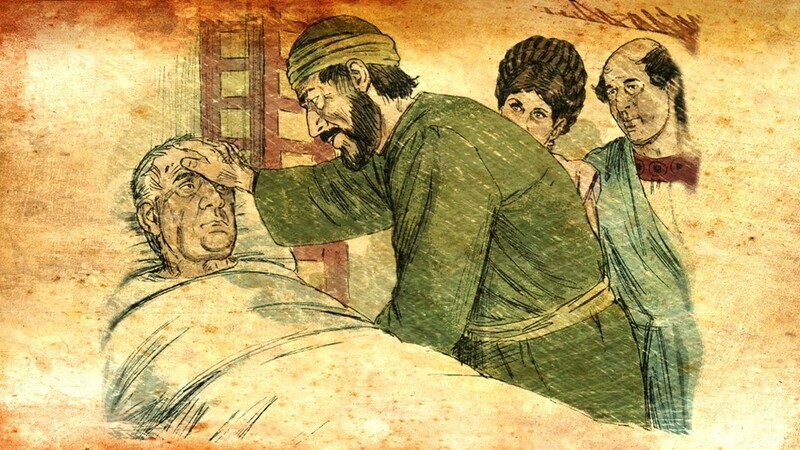 Others come to him and Paul continues his healing ministry. The people are so grateful that they provide all the provisions Paul and his friends need when they head to Rome three months later, after the winter storms have passed. The rest of Paul’s journey is easy. Again, Luke provides us with great detail, including a description of the ship’s figurehead, the twin brothers whom we know as Gemini, a constellation that’s easily identified in the night sky and important to navigation. 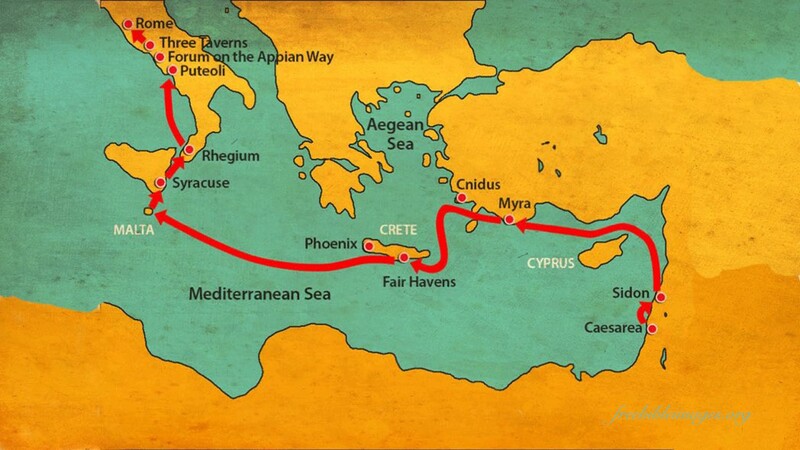 They sail north from Malta to Syracuse on the coast of Sicily, then pass through the gap between Italy’s boot and football, and on up to Puteoili, near present day Naples. There, Paul would have seen Mt. Vesuvius, which would blow its top in a little less than 20 years, as it buries Pompeii. A group of Christians put Paul and his friends up for a week. From there, they make their way overland, north to Rome. 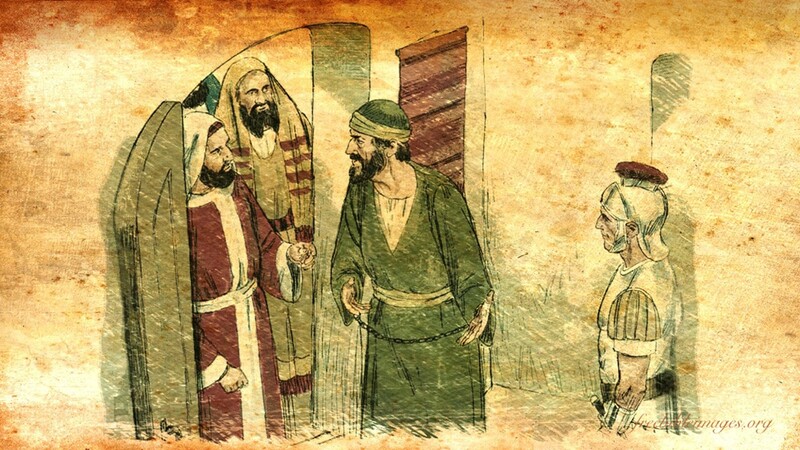 The word is out that Paul is coming and Christians from Rome travel down to meet Paul and his companions half way. 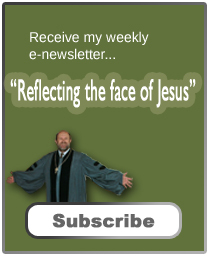 Luke tells this journey in a manner that almost allows us to forget that Paul is a prisoner. He’s being sent to Rome so that Caesar can hear his case and make a ruling. It appears Paul, who has befriended the Centurion in charge of his transport, has enjoyed much freedom during this journey. Even when they arrive in Rome, instead of locking Paul in a jail, he’s allowed to live on his own with a Roman guard watching over him. This arrangement would be like those today who get out of prison but have to wear an ankle tracking bracelet. 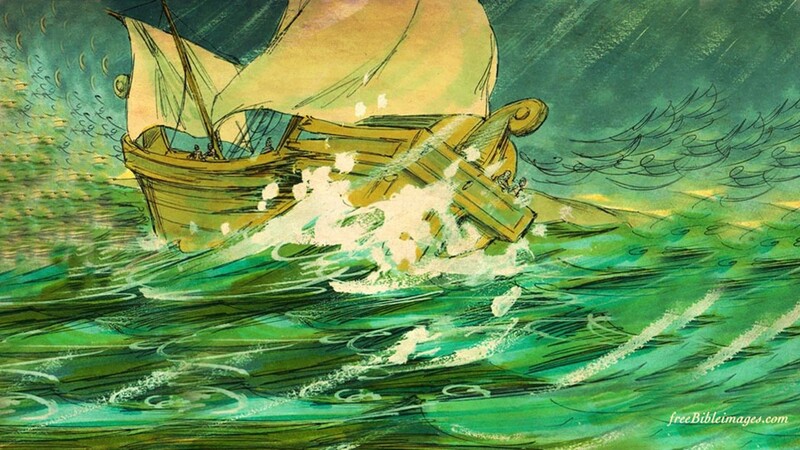 God is faithful and that angel who spoke to Paul during the storm that battered the ship was truthful. Paul has arrived safely in Rome. His adventures on this journey show us that while, if God has something for us to do, God will protect us, but it won’t necessarily be easy. The Christian life will have bumps along the way. 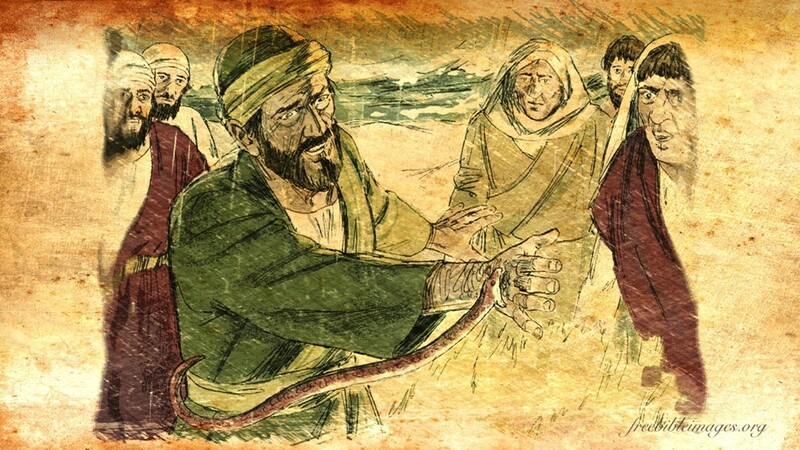 Paul endured chains, a terrible storm, an attempted munity and murder, a shipwreck, and a snake bite. But God continued to use him, despite the challenges, to bring healing to those in Malta and to offer hope the Christians in Rome. Does God have plans for you, for us? 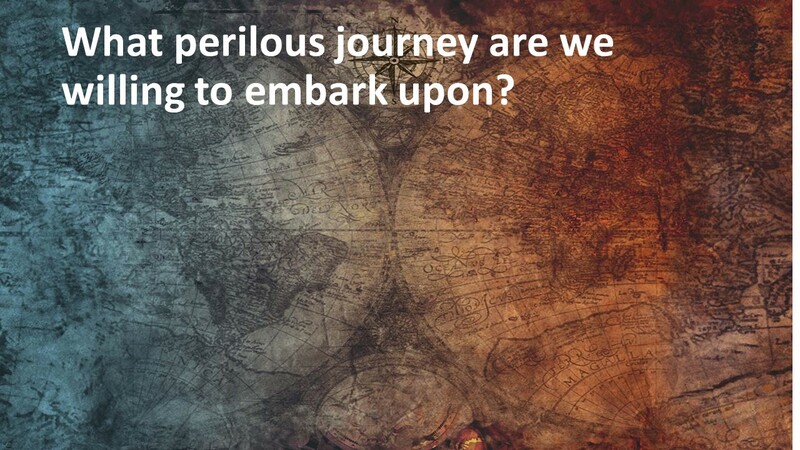 And if so, what perilous journey are we willing to embark upon? And here’s our last application from the text: as followers of Jesus, we’re not promised an easy path, but we are promised that a faithful God will watch over us and give us strength when needed. And that, should be enough for us to willingly follow our Lord. Amen. Well written post. I especially like your take away points–good reminders of how we ought to be living our lives and where our focus should be.